We can brainstorm here about parts of a computer we want to cover in the lessons we're preparing together. Here's the plan for today, as I flesh it out in my office Wed a.m. prior to meeting everyone at noon. The plan is essentially to Model and Demonstrate a set of spaces online where we can interact with our students, and have you Practice in those spaces, and Reflect on what you have practiced. In order to start this I had to find an appropriate space in which to write. I like Etherpad because I can save revisions (and revert to them) and also it has a slider to enable me to track writing process or find a previous version, so it's constantly preserving your work. You can copy paste, link to, or download any version. Google Docs is a great space but it's a little difficult to set up where you can do all that. I've noticed that students can wipe out all work up to a point inadvertently in Google Docs, and you might not be able to get it back. Etherpad is a better tool for working on the fly with students, since it's easily revertable to almost any prior state. http://tinyurl.com/esppdo is a shared Google Doc (its greatest affordances are when used as a Web page and shared purposefully with small groups). Here we'll find the other Etherpad clone list I found and tag it in Delicious so it shows up at the delicious link above. All of these are excellent tools for conversing with your class. Once we've got the groundwork laid, we'll start a new Etherpad and paste the content of the Google Doc into it. We can then do the exercise as the students might do it in class. When I work with students, I need to broadcast URLs to them in such a way they can reach them quickly. As we've seen, one way to do this is to tag them in delicious. However, in class, delicious can sometimes take several minutes to propogate what you've tagged through the network so that it shows up on your class computers. Another way then is to create a TinyURL. This works instantaneously. You can also set up a class space that you or everyone can write to quickly. This could be at your Moodle or Bb course, in a Google Doc, or in a class wiki (either one that is shared with the class, or that only you can write to). I'll back up my work here: http://tinyurl.com/esppdo (mainly in case this Etherpad becomes inaccessible at an inopportune time, I'll be able to recover quickly in another Etherpad space). I'll email the link to this document so everyone coming to class can see what we're doing today (once you get the link you'll be able to write on the document, for example you could write questions, or add useful information - in case of anything untoward or inappropriate or accidental, we'll have the saved and backed up versions to revert to). I will show you how to create such a blog and how to password protect it if you wish (in case you want to make it private, not public, for just your class). I will register those present as contributors to this blog. I will encourage you to comment on these postings so that you can see how Posterous works to combine blogging in both web and email spaces into a kind of forum that promotes conversation in your class. On September 15, 2010, the combination TESOL pp107 Multiliteracies course, TESOL Arabia EdTech SIG professional development series, and the regular Webheads meeting each Sunday noon GMT conducted an interview with Alex Hayes. Alex is the CEO of EDUPOV (http://www.edupov.com/), a company that sells wearable technology for education. Because it's wearable, it presents itself from the wearer's point of view, or POV. In reading this over, if I were a Wordle, the word I would make most prominent in Alex's proposal is CONNECTIVISM. On p.8/16 of his proposal Alex mentions the role of connectivism in networked learning to be one where participants build "a living literacy that embodies electronic connections amongst all other human considerations," which seems quite relevant to the topic of the Multiliteracies course. He says also that his proposed research "posits a Connectivist theoretical framework as most suited to examining the risks inherent with adding more veillance to flexible education settings." Wearable POV technology is as rich with affordances (for vocational training, for example) as it is fraught with potential for invasion of privacy, especially when the technology is geo-locatable, contains photographs of others, etc. These latter issues conjure a world of veillances: sousveillance, uberveillance, and of course surveillance, which we already (think we) know about (http://works.bepress.com/kmichael/187/). This word 'connectivism' stood out for me because although Alex and I have never met in person, we have interacted on numerous occasions. Alex and some friends of his held a relaxed chat for example as a keynote address at the 2009 WiAOC convergence, which I moderated (http://wiaoc09.pbworks.com/AlexHayes; I haven't located recording yet). Apart from that I have occasionally crossed paths online with Alex sometimes socially but always in connection with some learning event. This is not surprising because connectivism is how we both learn best (Siemens, 2005: http://www.elearnspace.org/Articles/connectivism.htm). Quite a lot of what I know about Alex I acquired not live but asynchronously, through podcasts (http://talkingvte.blogspot.com/, for example). He is an organizer of conferences in Australia (e.g.http://mobilizethis.wikispaces.com/). Because Australia is a big country with huge distances separating learners from places they would previously have had to go in order to learn, their educational system tends to be strong on distance learning innovation, and the conferences Alex organizes feature speakers discussing how POV technologies help trainers overcome some problems inherent in those distances. Having had this wider context in which to understand Alex's work, I realize that participants in the multiliteracies course I'm teaching might, without this perspective, be wondering what connection his work has with them. So I invited Alex to talk with us because I too feel that mobile technologies are crucial to the near future, if not the present, of connected learning, which is in essence the field that Alex is working in. I think mobile technology is moving faster than teachers are at this point; for example in Argentina, almost all bars and restaurants have wifi which customers frequently access through their mobiles, which they all seem to have; yet classrooms there block mobiles and seem resistant to technology of any stripe. Where I am in the UAE we are at the stage where all students have mobiles, often more than one, and bring them to class, and use them to get on the Internet, yet teachers here in the UAE are not really exploiting even computer-based internet that much in teaching (I mean, falling short of its true potential; mobile tech hardly at all: Stevens, 2010, http://tinyurl.com/vance2010calico). I noticed when traveling this summer that more and more travelers are carrying smart phone and using them in conjunction with Facebook for what they used to do in Internet cafes. This question of how what Alex talked about is relevant to teachers touches on the issue of cohesion, which has been raised in the multiliteracies course I'm teaching. There is some suggestion that cohesion could best be achieved if we worked from one learning platform (Desire to Learn, for example) rather than spreading ourselves thin on the Internet (wikis, blogs, Ning, YahooGroup and Grouply). Cohesion should not be confused with simplicity. Simple things are easy to understand. For example if I show you black and white and frame these with respect to a color scheme, this is cohesive, and easy to understand. But if I explain that color is only one aspect of human subjectivity, and that the importance of color might depend to some extent on whether you are right or left brained, and whether your eyes can detect colors in the first place, whether you have a prior schema based on racial prejudices or the color of hats in early cowboy movies, then you might feel that this topic is not so simplistic, though we might be able still to supply cohesion to our discussion. We would have to provide a platform for our discussion. If I chose just one then this might simplify our task of discussing the topic, but when the topic itself is multiliteracies and connectivism and how cohesion is achieved when people try to learn and disseminate knowledge on the Internet, then not modeling how that works through some sort of emulation of real life in choice of learning management system could in the long run be detrimental, like presenting simplified native-language based language learning materials as opposed to exposing students to authentically communicative situations. Of course if the students know nothing of the language then some simplification is in order, but if the topic is multiliteracies and connectivism and new ways of learning and knowing via networked learning environments, rank beginners are becoming fewer and farther between. Some degree of immersion is appropriate. One way to draw a distinction between beginner and experienced learners of a topic is to ask whether they are ready to learn on their own. If they need guidance at the start of their learning path, then the teacher can consider simplifying both the material to be learned and the platform for delivery. But if the learners are capable of driving their own learning, then a real-world simulation might be the best platform for them. This what I was hoping to discuss with Alex, some of the connections between his work and new literacies, and how we achieve connected knowledge by mobilizing that! MobilizeThis! and StreamFolio are two initiatives of Alex's I also hoped to get him to talk more about. This would have been a discussion of interface vis a vis what people actually do when using social networks online. The issue of privacy would have come up (veillance and uberveillance, and Adams's thoughts on distinguishing your networks by strength of ties, and preventing items meant for one set of ties, close friends for example, from getting out into another, a professional network for example). You can judge how closely we came to these goals when you listen to the recording of the interview in Elluminate at: http://tinyurl.com/150910alexhayes. This course is part of TESOL's Principles and Practices of Online Teaching Certificate Program; see http://www.tesol.org/s_tesol/sec_document.asp?CID=664&DID=2642. The course has fee paying participants but in such cases I focus on them while inviting the network of past participants who have taken previous TESOL or EVO Multiliteracies courses to join us if they wish. In networked learning, it takes a network! (at least a personal one, or PLN). So if you are reading this message you are welcome to participate. The central URL for the course is at http://goodbyegutenberg.pbworks.com, but we are carrying out conversations at http://multiliteracies.ning.com/ and http://multilit.grouply.com/. it, and then added a line for the calendar in my account when I got ITS embed code so the result was their calendar plus mine in one embedded object. I added pp107 in front of all the items I've put in the calendar so you can tell which are for the Multiliteracies course. At the moment it's noon and 13:00 GMT each Sunday and one other event at 11:00 GMT Sept 15. There will be more. and next day that at that time. I prefer the berry bush as a metaphor for setting out learning activities, you choose from a menu. This post began as a stub to see if I could get one of its tags, evomlit10, to show up at http://spezify.com/#/evomlit10. Tweets containing #evomlit10 show up immediately, but YahooGroup/Grouply posts and pictures on Flickr took hours to appear. The Flickr photos tagged evomlit10 eventually appeared at http://taggalaxy.com/ as well. So far this tagged blog post has not appeared at Spezify, nor have any of my delicious bookmarks, all tagged evomlit10. Oh well, go figgah! Personally I like the network aspect. We haven't seen people from previous courses post here yet, but I'm sure they are lurking. We've had a number of people not enrolled in the TESOL course join both our YGroup and Ning just before the course started, so again I like the public aspect and the potential for wider perspective. All are welcome to contribute constructively. I first read about the berry bush / conduit dichotomy in a work by Scallon and Scallon that I cited in my MA thesis in the very early 80s. A conduit is a linear progression of learning benchmarks, as would be presented in a book or on cassette tape; whereas the availability of random access via computers was opening up the possibility at the time of learning being accessed via a menu of choices, as one would pick berries from a bush, going for the most succulent and accessible (watch for thorns!) morsels. (now we do this, next that, then this) it gets a bit teacher directed. I realize some people are most comfortable with this and others are UNcomfortable if NOT this, but at least if we set up the items as a berry bush, the LEARNERS determine direction. Someone asked about a Common Area for our course. I replied, think of a university campus, some might choose the TV room in the dorm, others might hang out at the campus center, others might frequent the pub down the road, many might be found in all these places. Plus you have your cell phone; I guess on the Internet that would be the trail of tagged artifacts you leave online. We might find you through your postings to one of our common areas, or through the spaces you tag. It's a berry bush, we'll look for you in the bushes. You'll find others there. One of the things we'll learn in this course is how this works. I expect each participant in the course to have an ePortfolio. This could be a blog where participants could link to other spaces in their sidebars, as I do at this blog http://advanceducation.blogspot.com/. The ePortfolio I have in mind could resemble a table of contents, of which participant blogs would be but one entry. To create an ePortfolio table of contents, one way would be to open a Google Doc and keep a list of links to accomplishments in this course (and Publish it and share the link with us). Or create a Wiki with the same effect, or even a Delicious URL that points to all the items you had tagged 'pp107eporfolio-me' for example. Items pointed to could include your blog, your tagged URLs for the course at your delicious or Diigo account (as another example),and it could include also the URLs of any blog posts you had created at our Ning, as each post should be accessible via its URL on the Internet. Basically it's somewhere the rest of us can go to see what you've been doing in the course. I might go there in the first week in October to decide who deserves credit in the course. I would think that anyone who had an ePortfolio linking to a reasonable number of artifacts documenting reflection on the course topics, and who had interacted with others during the 4 weeks of the course, would deserve credit for having learned something during our time together, as demonstrated in the ePortfolio. 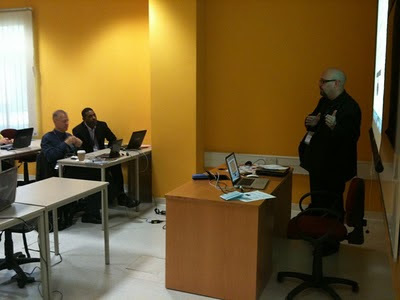 FLNW, or the Future of Learning in a Networked World, has a home: http://flnw.wikispaces.com. According to this URL it began with a meeting of minds not only in networked cyberspaces but in physical space in moveable feast progressing around New Zealand in 2006. Participants in that initial encounter included Stephen Downes, Leigh Blackall, Alexander Hayes, Konrad Glogowski, Jo Kay,Teemu Leinonen, John Eyles, Rose Grozdanic, Derek Chirnside, and many others along the way, http://flnw.wikispaces.com/participants, etc. Michael Coghlan flew over for it from Australia, and Barbara Dieu, or Bee as we know her, traveled to New Zealand all the way from Brazil. So when Bee got the idea to host the 2010 FLNW in Brazil to be anchored at BrazTESOL in Sao Paulo I submitted two proposals for the conference which were both accepted. Bee created a wiki page for the event at http://flnw.wikispaces.com/brazil complete with links to participants and itinerary and waited for others in the group to fill in the wiki. When Michael and I signed up she arranged what funding she could for us (in my case, a hotel room for 5 nights in Sao Paulo, highly appreciated, beats a kick in the rear :-). Tantalizingly, a Vivo Institute in Sao Paolo was arranging an event for about that time, inviting Stephen Downes, George Siemens, and Teemu Leionen, so the ingredients were in place awaiting critical mass to kick it into gear. and on July 16 flew to Sao Paulo where Bee and her husband Pierre met us at the airport and whisked us into the countryside for a taste of rural Brazil unplugged, offline. There is a link at my wiki to the next stop on the itinerary. Casa Thomas Jefferson in Brasilia were hosting a conference on Thursday and Friday and we flew up for the second day. We were taken to a great buffet lunch and then to a room at CTJ where our event was scheduled. I had got my colleagues to title it "Thinking SMALL" to accommodate my new acronym for CALL, social media assisted language learning. I don't think we actually mentioned the acronym during our presentations, which took on a sort of free-form structure, where we asked participants to tell us why they had joined us, and took it in turn from there. As usual we took videos and pictures and posted online to leave a record of the event; e.g. From there the FLNW crew enjoyed a Saturday with samba in Brasilia and progressed by plane on an early flight back to Sao Paulo where we arrived at Bee's flat and got onto wireless just in time to catch Claire Siskin in Pennsylvania, Anitha Devi in India, and Rick Rosenthal in Amman Jordan at the tail end of the weekly Webheads Sunday noon GMT meeting at http://tappedin.org. We then hopped in Bee's car and drove 4 hours to the tiny bay of Toque Toque Piqueno, at a picture postcard beach house where Pierre was waiting for us with the shrimp and vegetables that would become our dinner. Visions of wireless dancing in our heads were quickly dashed by reality, and we were forced to postpone a projected podcast with Alex Hayes and turn our attentions instead to the white sand beach with its alluring cool water for bathing. Hopefully the future of learning in a networked world will include ubiquitous access to always-on connectivity, where bandwidth is as plentiful as water. In our case, access to Internet, when we had it, was limited due to the incessant hospitality of the Brazilians we were with, who liked to sit for hours in restaurants, enjoying each other's company, while sipping the local beverages. 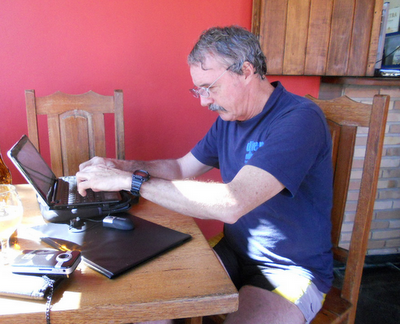 Here at Toque Toque Piqueno, where we have time but no bandwidth, I'm composing this blog post with hopes of posting it on arrival at our hotel in Paraty, where we should end up at some point today (and which SHOULD have wireless, and we'll see when we get there). If we do find a connection, we might try to hook up with FLNW as planned, and after two nights in Paraty we'll return to Sao Paulo and go our separate ways, Michael back to Australia via Chile, Bobbi back home to UAE via Houston, and me on to Porto Seguro where I'll meet (at long last) Felix Zaniboni, one of our orginal webheads from 1998 or earlier http://prosites-vstevens.homestead.com/files/efi/efwbahia.htm. Then I'll be back in Buenos Aires on Aug 8 for a pair of talks on August 9 and 10 with webheads there, an additional day in BsAs in case anyone wants to meet me on Aug 11, or otherwise I might pop on the ferry to Uraguay for a day trip, and then I leave the FLNW trail for a brief sojourn in Peru before returning to Houston and home to Abu Dhabi to reunite with my dear wife Bobbi. I just returned to Abu Dhabi from the CALICO conference in Amherst where I talked about my chapter in the book for which I was a section editor and that was featured on CALICO’s portal web page prior to the conference https://calico.org/page.php?id=452;. The book is on CALL in limited technological contexts and my chapter “Shifting sands, shifting paradigms: Challenges to developing 21st century learning skills in the United Arab Emirates” discusses not limited technology per se, but limited experience with the latest uses of technology causing educators to not exploit its full potential and benefits. I point out in my chapter what some of the hurdles are preventing teachers from embracing the new technologies and I set forth a strategy for overcoming them. In a nutshell the strategy explains how we can be change agents by getting our colleagues to interact with us using 21st century Web 2.0 technology tools and writing use of these tools into the curriculum where they are taught by teachers whom we help to familiarize with some of the uses and affordances of these tools. I posted the slide show outlining the chapter at Slideshare.net, direct link http://tinyurl.com/vance2010amherst. I put the full text of my final draft of the book chapter itself at Google Docs and create a tiny url for it at http://tinyurl.com/vance2010calico. The text is hyperlinked from the slide show, and I linked to the slides from the Google Doc. I hope to make a slidecast for the slide show and podcast that at http://vancestevens.podomatic.com/ if I can find a spare moment. This would further model my ideas for teacher training, and for helping students acquire the multimedia skills essential to communication in the 21st century. The paper articulates what is needed for several projects I’ve got going at the moment. The slides would probably get me through several talks I’m giving in Brazil and Argentina in July and August this summer. For example, in my presentations at BrazTESOL I’ll be talking about some of the affordances of teaching and learning through a PLN (personal learning network) and the social networking, tagging, RSS, and paradigm shifting associated with that concept. I know I need to couch all these topics, unfamiliar to many, in terms that teachers can easily understand, to help them see the benefits and importance to them. It won’t be the first time I have addressed such audiences; for example, explaining tagging to Ministry of Education English teachers at their most recent Nile TESOL Conference, where they were in Cairo and I presented online from Abu Dhabi http://justcurious.posterous.com/powerful-ideas-and-tools-for-getting-the-most-0. I wrote the book chapter in 2009 after having proposed a set of technological innovations to a previous director of the department where I work, but I have since got my teeth into some other projects, which I hope will help teachers learn more about the technologies they might be using with students as they prepare to teach from materials I am writing in conjunction with one of these projects. In curriculum development, I am helping to develop a computing support course to students in an intensive English program at the Petroleum Institute. My part of this project is to create curriculum introducing tools such as Google Docs and Delicious to support an English dept. focus on collaboration, team building, and Internet search. The problem for teachers is that in order for them to effectively teach these skills to students they have to themselves be experienced users of the tools. As this is not yet the case, I will need to find ways for the English teachers to use the tools in the run-up to these components being taught. My plan is to create documents for them in Google Docs, create a project tag, and show the teachers how we can track latest versions of shared documents pertaining to our own collaboration and find them online via Delicious and other tools that will track tags. I’ve been speaking and writing at length for much of the time I’ve been at the Petroleum Institute on these tools and on my many experiments with how they can be used with students as well as teachers in their professional development, but it is only recently that there has been wide enough interest among colleagues with whom I work face-to-face to allow me to take my ideas mainstream. One manifestation of this interest is where colleagues and I in TESOL Arabia are rejuvenating the TESOL Arabia EdTech-SIG with emphasis on online potentials for promoting the “three C’s” of collaboration, communication, and creativity. Jim Buckingham and I kicked off this latest phase in a joint presentation recently at Zayed University in Abu Dhabi where we connected with Phil Cozens presenting on-site that same morning in far-away Ras Al Khaima http://justcurious.posterous.com/modeling-and-demonstrating-professional-devel. We used the Adobe Connect platform that PI recently purchased and where I have been granted permission to set up and conduct online meetings. Since that success, those interested in taking the lead on promoting use of such tools in the UAE have met online to discuss leveraging them to help bring teachers up to speed with technology throughout the UAE. To this end we might have regular online training sessions this coming year, and the English teachers at the PI might want to get involved, in part as a preparation for teaching the intensive English course in the Fall. So these developments could play into one another. A further opportunity for teacher training will arise when I teach my PPOT (Principles and Practices of Online Teaching course on Multiliteracies online again for TESOL from September 3 to October 6, 2010 http://www.tesol.org/s_tesol/sec_document.asp?CID=664&DID=2642. I am planning to run the course in conjunction with a face-to-face continuing education course for colleagues at the PI where the live audience can benefit from interaction with the distributed one and visa versa. If English teachers at the PI take advantage of that then this will serve to ground them in some of the tools and competencies they’ll need to most effectively teach the materials I’m creating for our students. One of the English teachers completed my previous rendition of that course http://tinyurl.com/21centuryskills4pdo, so we’ve made a start here already. To organize and promote such courses and show how the many parts of the overall endeavor are loosely joined, I am starting to conceive of a cookbook for 21st century project management. Here is its first item, a recipe for getting a project off the ground using open education resources. 1. The first thing you should do is agree on a tag for your project. For example, the one we agreed on for the TESOL Arabia EdTech SIG was taedtechsig. Some of us had already been using uaedu which seemed like a nice choice until we tested it in Twitter and with Spezify and found it was already in use and that some of the hits were not especially educational: http://twitter.com/#search?q=eduae and http://spezify.com/#/eduae. Similarly, we found that edtechsig produced hits from NileTESOL in Cairo http://spezify.com/#/edtechsig. Now this brings up another point. If we wish to aggregate content only for us then we need to create our own unique tag (taedtechsig produces no competing hits, thereby fitting this bill). However, if we wish to call attention to colleagues in Egypt to what we are doing then we could use their tag, and our content will appear when they attempt to aggregate their own. So two affordances of tags can be immediately seen. First, they can help you aggregate content on your topic. That is, if we want to see content placed on the Web related to this topic, we can use certain tools to locate and pull into one place content where its creators have used that tag, and second, if we want to create content and bring it to the attention of colleagues in a common endeavor, we can tag it, and hope they will be able to find it. For TESOL Arabia EdTech SIG I will use the two tags that will cause content I view or create to aggregate with other content tagged taedtechsig, and also I’ll tag the same content edtechsig in an effort to get the attention of our colleagues in Egypt. 2. The second way to loosely join the disparate parts of a 21st century project is to tag them. Tagging can be done initially by creators of content. However, consumers of content can also tag content they find online using Delicious or Diigo, or other such tools. Delicious for example can be used to illustrate to both teachers and students how quickly a web site tagged by one user can become known to another. Delicious is a great way for anyone collaborating on a project involving Internet research to see what has been found by team members, or a way of aggregating content on a tag; see for example, http://delicious.com/tag/writingmatrix. As another example, both creators and consumers of content on Flickr can tag there. In other words, if I post a photo on Flickr I can give that photo (or set of photos) a tag. However, I can also tag photos I find interesting on Flickr (assuming I’m logged on to Flickr, and that the photo has been granted a creative commons license allowing others to tag it). Many are familiar with this same concept from Facebook, where we can tag photos of friends there, and the site provides a means for seeing on one page all the photos tagged for a particular user. So to summarize this as a recipe in the cookbook, once your group has settled on a tag, then all members should tag as many sites used by the group as possible. This can be done by both creators and consumers of that content. Group members who create content (post photos or create blog posts, for example) should apply the agreed on tag to that content. Those who view that content online should tag it using their preferred social bookmark system. Then search tools such as Spezify and Delicious and Diigo can be used to find content as it aggregates around that tag. Another important use of tags is as ‘hash tags’ or #tags in Twitter. Using #tags has affordances beyond a simple search. You can search in Twitter and find #tags (and other content matching your search) but if you use #tags then you can click on them to bring up all content using that #tag. Use of these techniques puts the “3 C’s” of 21st Century Learning into your online projects and those of your students. The three C’s are communication, collaboration, and creativity. Here are a few ways that these are addressed through the cookbook for 21st century project management. These lists are simply starters; they could be added to endlessly. Is this blog good enough to make the Lexiophiles list of best blogs on language technology? I received this in an email from Priscilla Andrade at Lexiophiles. We have received 495 nominations for The Top 100 Language Blogs 2010 competition. For each of the four categories we have admitted 100 blogs into the voting phase. Your blog ‘adVancEducation’ (http://advanceducation.blogspot.com/) is included for voting in the 'Language Technology' category. Congratulations! The voting phase starts today, May 12th, and ends on May 24th 2010. Winners will be announced May 28th. It seems they are in the position of recommending blogs related to language and language learning, and to corroborate their own choices they decided to ask their followers to vote on their favorite blogs. How long will Facebook last? According to the stats cited in its Wikipedia article (the same page also comes up high in a Google search on 'Facebook statistics') growth in use of Facebook was 145% last year in the USA, and in over-55's an astounding 923%. I don't think it will go away next year or the year after. I think one reason for Facebook's success is that it helps us bridge that gap between our work and social and family lives that used to be studiously, and artificially, kept separate. We take bridges for granted now, it's human nature to build them, they're generally positive developments. Webheads does this too. Personal + professional = natural, and thanks to technology we CAN build these bridges now, whereas before digital natives, this was impossible on such a grand scale. As an inveterate cat herder I instinctively steer away from trying to drive social media. It's media, it drives us (The Machine is Using US, right?). So I would advise to accept the way our world has headed, blended learning, blended professional development, blended families and friends. There's no need to build artificial walls unless you really find a problem. A lot of times we assume there will be or could be, but when once we accept that healthy mix of personality and professionalism, it turns out the two often go compatibly hand in hand. Of course, don't keep skeletons in your digital closet, but I think there is growing awareness of how to manage that downside. I encountered recently the ameliorating concept of "mutually assured disgrace" where people are learning not to rattle the skeletons in the closets of others since we are all equally vulnerable to inappropriately abusive probes of our digital online artifacts - but for most of us, our digital footprint speaks highly of us, well beyond reproach, and the real issue here is making students aware of the ramifications of similarly maintaining their own web presence. 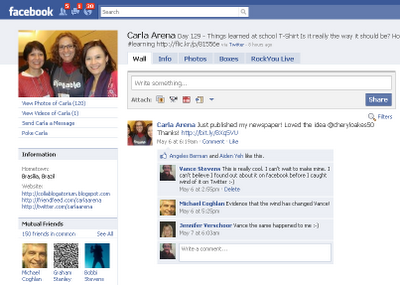 Accordingly, I haven't had any problem yet, and I find my use of Facebook changing as I use the media. As one example of this change, check out http://screencast.com/t/NGRlZjMwMDg, where I expressed surprise at finding out about http://www.paper.li in Facebook from Carla Arena's post rather than first on Twitter as I would have up to now expected, and this attracted comments from Michael Coghlan and Jennifer Vershoor, who both concurred with this observation. The times they are a changing, at an accelerating pace, rapidly approaching Singularity, http://www.kurzweilai.net/articles/art0134.html?printable=1. Until we reach that point of infinitely altered intelligence (which in Kurtzweil's words, "can manipulate matter and energy to do whatever it wants"), best to go with the flow. Recently, a member of my personal learning network has asked me to advise her on a training strategy for introducing CALL to teachers in Algeria. I've had some experience with her situation; though it is universal across cultures for appropriate uses of technology to be misunderstood by educators, particular contexts have their particular concerns. I've long been trying to make inroads on computer literacy and multiliteracies in Oman and the UAE, and even in Tunisia in 2004: http://prosites-vstevens.homestead.com/files/efi/papers/tunisia2004/mahdia.htm. One problem with the Tunisian event was that its organizers could not articulate beforehand what it was they wanted me to do there. They wanted me to show them how to teach online, so when I arrived I implemented a program whereby I got the participants blogging, and I took pictures and put them online, and tried to get the teachers acting as a community. I got some resistance at the time in the form of: OK, we don't know what we want, but this isn't what we expected! Blogging? They did it and many enjoyed it, but the majority didn't see the point. However, now, six years later, the YahooGroup I set up for them still functions and I'm still in touch off and on with some of the teachers I met there via some of the artifacts we placed online way back then. To organize the project, I created a wiki for them using Etherpad technology. Etherpad is a company that's been absorbed by Google and the technology is now apparent in the greater collaboration speed of Google Docs. The code for Etherpad is open source so it's been replicated at other sites now that the original Etherpad no longer functions. So here at http://typewith.me/GzXAtU8oml I introduced the concept of wiki and writing collaboratively on the web, by anyone, for free without passwords. This concept is set in the context of a practical site where students can see that they can contribute (on the typewith.me site, they all wrote in their session descriptions, prompted only by a note in the wiki asking them to do that). A model for project management is established, where participants can collaborate and communicate and display creativity (the 3 c's of 21st century learning). The Wikispace site http://earthbridges.wikispaces.com/Earthcast+2010 was the wiki used for organizing the event in the first place. In looking at the history of this wiki we see how the seed was planted and how it grew into a full-blown project and successful event with hundreds of collaborators around the world on April 22, 2010. (This led my students into a discussion of how a wiki's history protects it from vandalism, and how that works with Wikipedia; with Jon Udell's viral screencast on "Heavy Metal Umlaut" serving as an instructive example: http://jonudell.net/udell/gems/umlaut/umlaut.html). 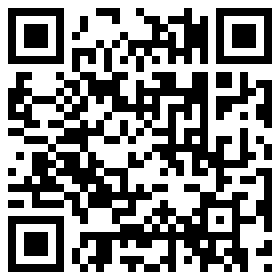 For our portal I created the much easier to remember TinyURL:http://tinyurl.com/earthcast10pi. Now we've expanded the notion of Web 2.0 with the concept of creating URLs that are mnemonic and shortened (especially important if you want to tweet them). If you look at the content of the typewith.me portal site you find that Twitter is well represented here. It is one of the ways we announced our event, and there is evidence here of responses on Twitter, so we weren't working in a vacuum, far from it. By connecting students with real people, Web 2.0 makes learning relevant to them. 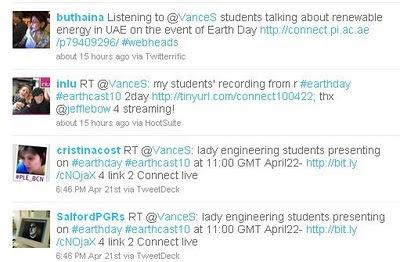 An even more direct connection with real people was achieved using Adobe Connect, which was slotted into another event, the 24-hour "earthcast" webcastathon at http://earthbridges.net. Through this event, more contact with students and other teachers was made via Java chat, live streaming, and Skype backchannels. Participants become aware of the world of knowledge seekers available to them, and how to contact and keep in touch with them. One such tool modeled, demonstrated here is Delicious, which uses common tags for keeping track of links pertaining to the event and for communicating socially what links others are finding. The common tag for the event my students participated in was earthcast10. That tag can be searched in Twitter at http://twitter.com/#search?q=earthcast10, and to get a good illustrated overview of what how the event was celebrated around the world, visit http://spezify.com/#/earthcast10. These tools taken in and of themselves can appear too numerous and overwhelming to beginners, but when pieced together into a project such as this one, how the components work together is easily understandable. The idea is for the teacher to model the use of each part, to bring tools to bear on an as-needed basis, and the learners learn by using the tools. The learners in this case had conceivably used or heard of none of these tools beforehand. The tools were simply placed before them and they used them as they needed them. They aren't hard to use and they work well for what people want to accomplish. It's not necessary that each person know about all of the tools, but only that someONE knows about these and others and can place the tools near the learners where they are needed, and model the use of the others as they come in handy. In my own experience working this semester with students I find that it would help if they had some preparation in the course of their traditional classwork, because depending on the nature of the project, they don't necessarily see the affordances of the tools, and can end up not taking advantage of them. I have tried to address this by mainstreaming some materials I use with my students, here: http://issuu.com/vances/docs/social_networking_2009_lessons1-3. When students respond to the modeling, demonstrating, and reflection put into practice, the result can be a transformative learning experience. And to make it happen teachers need to be connected in order to create and be available for opportunities to collaborate on projects such as this one, into which students can be drawn. In Downes's scheme, where teaching is to model and demonstrate, and learning is to reflect and practice, I model the learning part by creating posts such as this one, where I reflect on the experience and try to understand how it happened, and then put the next iteration into practice with my students. My own addition to the Downes scheme is to teach is to learn, by which I mean it's a percolative process, one that true teachers model as they re-learn how to learn, and then show the way to students, whom we are training for jobs and careers that haven't even been invented yet. To cap a busy day I participated in a second Adobe Connect event on April 22, as one of the panelists on a Virtual Round Table discussion of EVO's global training camp. Here I got to articulate some of these views having just come away from the Earth Day event. A recording should appear eventually here: http://virtual-round-table.ning.com/events/panel-discussion-evos-global. This topic of teacher training and how to inculcate the "culture" of learning necessitated by changes we face in the 21st century figured heavily in the discussion. The word culture was introduced there by Barbara Dieu, and it speaks to the difficulty of the task to realize that a person of her calibre and expertise, a world-reknowned leader and frequent speaker on the educational applications of social media, appears unappreciated and marginalized in her own workplace. When many of us think about PLN, or Personal Learning Network, what we envisage involves colleagues sharing information in a social network or community of practice (see http://delicious.com/vancestevens/PLN and http://delicious.com/vancestevens/PLE for numerous examples; and I've always liked Scott Leslie's nice collection of PLE diagrams: http://edtechpost.wikispaces.com/PLE+Diagrams. 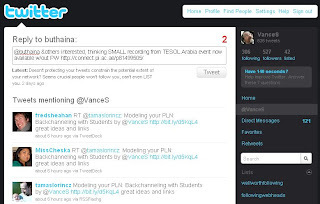 We less often think about setting up PLN's with students, but at http://tinyurl.com/vance-socialnet09 I list one of the ten paradigm shifts that I think educators must make as they move into facilitating learning in the 21st century as being "transfer [or] using technology and social media in one walk of life and then transferring those heuristics for learning into the classroom and other teaching situations. For example, people who frequently use Facebook or Twitter might tend not to use social networking or backchanneling in the classroom, because they don't see how to transfer what they do in one part of their life to how they manage their more formal teaching and learning environment, because it's not in the curriculum, etc." Educators backchannel through their PLNs but in fact we should all be doing this with students (see "Where 3 R's meet 3 C's" about what we should be teaching as 21st century life skills: creativity, communication, collaboration - http://www.britannica.com/bps/additionalcontent/18/34037342/The-Three-Rs-Meet-the-Three-Cs). We should be modeling how we network in order to show students how they can do the same in order to become productive knowledge workers in those jobs in the future that haven't been invented yet, as articulated in http://webheadlink.wordpress.com/2007/01/08/jobs-that-havent-been-invented-yet/. The problem is where networks might collide, as when we mix our social networks on Facebook or Twitter with the very different worlds of our students, and risk distracting clutter in our professional networks if students are allowed into them, or suspicion of impropriety at worst. Twitter itself has introduced a solution: LISTS. Now you can create a list for your students or separate classes of students and add them to the appropriate list without having to "follow" them. In this way, they don't appear in your Twitter stream, but you can open a LIST and catch up with what they are up to that way. There are other means of backchanneling in classrooms. Edmodo is one which I have used with students. It works well if people in the class monitor it, but the problem is, it isn't 'real'. We go to Twitter every day in the course of our normal workflow. You check Edmodo only when it occurs to you. Your students do the same. It lacks traction. But many teachers use it as a backchannel tool similar to Twitter, and because you need a code to join a group, it's safe for students. Another good backchannel tool is Etherpad. This tool was so good that Google bought it to use its technology in Wave. Consequently the tool at http://etherpad.com is shutting down this month (http://etherpad.com/ep/blog/posts/transition-update). However its code has been released as opensource (http://code.google.com/p/etherpad/) so it has already been resurrected in other implementations, and its code will live on as part of Google Wave, which could serve as a model for backchanneling with students or on any kind of project in their productive lives in the future (though a tool that would be effective with students needs to be a lot simpler to use than Wave is right now). You can use Delicious or Twitter or Google to find other sites that have used the Etherpad code already; e.g. http://twitter.com/#search?q=etherpad and http://delicious.com/tag/etherpad. Readers of this post could help one another by leaving links in comments below to sites that use the Etherpad code; for example: http://piratepad.net/ and http://typewith.me/. I've got almost 200 bookmarks for Twitter here: http://delicious.com/vancestevens/twitter, many of them mentioning ways Twitter can be used with students. This posting derives directly from my PLN. It was originally a response to Lori Teng's comment on my post in one of my other blogs here: http://justcurious.posterous.com/how-to-start-your-pln-on-twitter. If Lori hadn't commented on that post, and triggered in my brain all the synapses there I'd been storing up related to backchanneling with students, this article would never have been written. This post therefore is yet another example of how a PLN works to cause us to model and demonstrate for one another, to reflect on and practice what we are learning, and to percolate how we develop our knowledge back into our communities and networks in an ongoing process of lifelong learning. 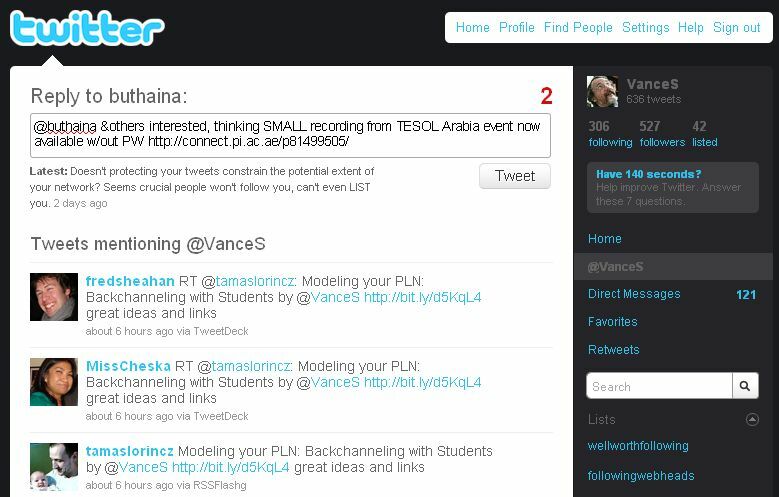 http://twitter.com/VanceS/status/10410955223 shows the above Twitpic of Gavin Dudeney presenting at TESOL Arabia, Dubai, March 13, 2010. I took the pic on my iPhone during his presentation, Twitpic'd it, and Gavin showed it to his audience when he checked his Twitter feed 5 minutes later in his presentation. TESOL Arabia conferences in the UAE have not historically been well connected. Often they are held in hotels where there may be wireless only in the lobby, or perhaps even in some of the presentation rooms, but in all venues presenters could expect connectivity to be patchy to non-existent. Certainly you wouldn't plan to rely on an internet connection under such conditions, and so I arrived at TESOL Arabia this year with a PowerPoint presentation safely stored on my laptop and backed up to a flash drive, having made no preparation for delivering it to anyone beyond the brick and mortar campus at ZU apart from a mere mention on my PLN that I might try to webcast from there. The part of the presentation that I didn't give because I ran out of time was to be a complaint against conferences which forced participants to remove themselves from their networks (fortunately, not an issue at this happily interconnected conference in Dubai - the only issue was that hardly anyone was using the connectivity; but that's the next step beyond the scope of this post, and something I hope to address in a TESOL Arabia chapter presentation from Abu Dhabi April 10, 2010; preliminary info at: http://bit.ly/Apr10_prez_TA_Auh). As I ran out of time, I was leading to the question of what TESOL Arabia, or any viable configuration of practitioners interested in futhering their professional development, is or should be. To arrive at what I was leading up to I had presented a distinction between groups, communities, and networks, and was showing how knowledge resides in networks and is passed around the network through modeling and demonstrating practical applications of knowledge applied to practice. In this model of how knowledge is disseminated in the 21st century, I suggest that it is never appropriate to cut anyone, at any time, students in class, participants at a conference, or knowledge workers attending meetings, off from their networks. As a result of this trend, professional development less and less happens mainly at conferences. For many professionals, development happens every day in the course of using Skype, Twitter, or Facebook, reading blogs and wikis, or viewing and sharing tutorials and presentations on YouTube, TeacherTube, Drop.io, uStream, TED Talks, etc. etc. This means that for many professionals, face-to-face conferences are of decreasing importance. As most of us agree that learning is mainly social, such conferences seem most appreciated for their networking potentials rather than for the papers presented there, which more and more often can be read or their recordings viewed online, as archives of such materials become more and more widely distributed. Travel to distant cities to participate on site in conferences has become inefficient and less necessary than before, and is less crucial for gaining knowledge than opportunities available in cyberspaces dedicated to education. Accordingly, one can argue that face-to-face meetings (in the workplace) risk a similar obsolescence, or that the notion of forcing students to attend classes is becoming archaic when podcasts of lectures are available, and indeed interaction around their subject matter can be made more rewarding using a combination of synchronous and asynchronous online resources. In other words, to face-to-face gatherings, add a networked dimension. Hold the meeting, or conference, or class in a brick and mortar edifice as usual, but configure the space so that it lets in the network. Now you have the best of all worlds that blended learning has to offer. Participants in the physical spaces are able to look each other in the eye and benefit from each other's company, but they can share what they are doing with the wider world, or draw in people and resources from their PLNs or personal learning networks. In this way consumers of content at a face-to-face gathering can generate content online, and as this content is reflected on, remixed, and recycled, and filtered back to participants either physically at or virtually enjoying the live event, everyone involved would be learning more than they possibly could if the event were cut off from the networks of those who participated. There is opposition to this notion. Wide Web of diversions gets laptops evicted from lecture halls is an interesting article, recently discussed on the Webheads list, about how PLN's can be distracting, but I think this will continue to be a problem only in the short term. This article calls attention to how inappropriate use of PLNs in contexts where greater focus is called for can be detrimental to the individuals who engage in such behaviors. With greater experience and sophistication, such behavior is likely to dissipate, as people come to distinguish the affordances of network enhancements to how they learn in face-to-face situations from uses of networks that are decidedly unprofessional in such contexts. I had meant to suggest in my presentation (as I did in the slides) that in future, successful conferences and professional organizations will have to combine opportunities for face-to-face interpersonal connection with the connectivity to allow seamless interaction with distributed personal learning networks. Those that do not will become decreasingly relevant I am aware that not all agree that this should be the case. As the article indicates, not everyone sees networks intrusion as a positive force in the dynamics of face-to-face interaction. So I was hoping to raise the question, if conferences are networked, who benefits? who loses? At that event, George Siemens agreed that conferences that do not provide and encourage networking are "unacceptable" but this is what one expects at annual TESOL conferences, for example, which are always held in corporate convention centers, and where getting computers inside and setting them up and networking them is done by unionized labor, and any bandwidth provided is done at a surcharge that prices it beyond the range of most individual educators. Even to get a data show to make a presentation there, the presenter has to pay an inflated fee to the convention center to cover the costs of union wages and to line the pockets of the shareholders investing in the convention center, a mindset quite at odds with that of most educators who pay so much of their limited resources to attend those conferences. The CALL-IS (interest section) in TESOL has done a remarkable job of gaming this system so that a room full of Internet ready computers has been available for presentations at all TESOL conferences since the mid-80's, and I've made a number of presentations at TESOL-sponsored events where thanks to TESOL subsidy for its own sponsored events, Internet was provided. One of the most memorable of these was at an academic session CALL-IS put on in Salt Lake City in 2002 http://www.vancestevens.com/papers/evonline2002/academic.htm. Each interest section has the right to place its academic session in the program and as the event is TESOL-sponsored it is possible to request an Internet connection. Thus the panelists at this event were asked if they NEEDED an internet connection. Bearing in mind that this would be expensive, and even when Internet is expected, experienced presenters always prepare a backup slideshow that can be delivered unplugged if needed, and so as not to waste precious resources, every panelist but me said, no, they didn't need it. What would I need it for? I wasn't exactly sure, but I had the notion to stream the session live. 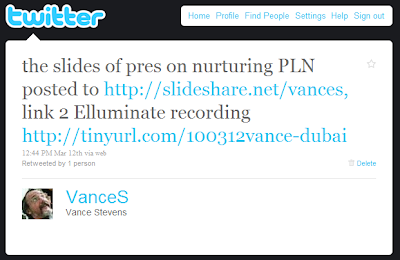 The year before I had been asked to give a plenary address at an IATEFL conference in Nicosia, and we had streamed that along with several other of the talks at that event http://www.vancestevens.com/papers/cyprus2001/index.html. This had come about because on a mailing list, Neteach or TESLCAL, someone had mentioned they wanted to do a voice hookup for educational purposes and Eric Baber had replied that he had an underutilized streaming server which he was using to deliver live voice and video language courses from NetLearn Languages that he would be willing to offer as a solution to what the lady wanted to do. I twigged immediately to the potential of what Eric was offering the community. I wrote him and asked if I could use it to stream from Cyprus. I don't remember how it came about, but Sophie Ioannou-Georgiou, who was in charge of the conference, was so keen on the idea that eventually all conference presenters were asked if they would consent to be streamed, and for all those who replied affirmative, Eric set up web pages where each presentation could be accessed live, and where the recording could later be replayed. He did this all for free, and the conference was a great success especially due to this remarkable commitment and innovation. 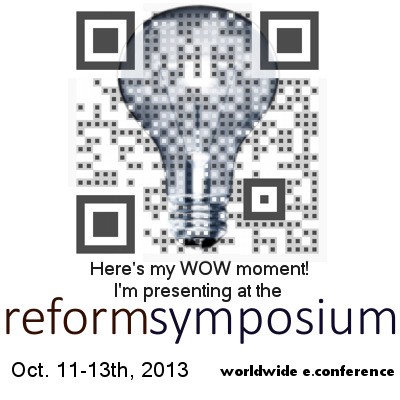 I was the first presenter at the conference, the first to be streamed, and the first to be recorded. When the second plenary was streamed and recorded, the person managing the stream at our end, unfamiliar with the process, over-wrote my file with the recording of the second presentation, and my talk was forever lost to posterity. Michael Coghlan, another visionary as ahead of his time as I, was the only presenter at the conference who had offered to be streamed IN. That is, whereas a dozen presentations were streamed worldwide FROM the conference, only Michael had realized he could take advantage of the option of making a talk at the conference from a remote location, in his case Adelaide, Australia. Michael's session was a concurrent one. All the presentations took place in good sized auditoriums, in which Michael's talk only had a few attendees. I was managing the stream in from the podium, Michael asked me more than once how many people were in the audience, and more than once I evaded the question, not having the heart to tell him only three or four people. Not only that but one lady in the audience was a fan of Michael's and had come to the presentation specifically to meet him. When it became obvious that he wasn't actually there, she complained loudly how cheated she felt when in fact she was witnessing a pioneering event illustrating how we were on the verge of realizing grand potentials for global collaboration in independent learning and ongoing professional development. This audience reaction to our early online adventures was nothing unusual. Later in our collaborations together, Michael and Buthaina Alothman both flew in to Abu Dhabi to present with me live and in person from the main auditorium at the Petroleum Institute as a part of a virtual event: one of John Hibbs's last epic 24-hour Global Learn Days http://bfranklin.edu/gld/. I had announced the event to my colleagues at the PI but unbeknownst to me there was an important rugby match on at the time and I was later told that that event was well attended. Michael and Buth and I presented from the stage of a 100 seat auditorium, which was packed during our presentation with three or at the most maybe 4 people, but, get this, we counted at least 60 in the synchronous online chat. Buthaina archived the event here: http://alothman-b.tripod.com/wia-buth-gld.htm. Although the concept has been slow to take off, it's getting these days more common for there to be strong online components at on-site conferences. I can think of numerous examples: Shanghai 2.0, NECC, Educon 2.0 etc etc. IATEFL has been expanding its online events; for example at Harrogate this year: http://iatefl.britishcouncil.org/2010/, and CALL-IS has made a major effort to announce a series of streamed events from the Eletronic Village, Boston TESOL 2010, http://academics.smcvt.edu/cbauer-ramazani/TESOL/2010/Webcasts/Sessions-Schedule.htm. But getting back to the UAE, the TESOL Arabia conference this year was at Zayed University in Dubai, a remarkably beautiful campus with ubiquitous Internet. I got to the conference in time for the plenary at 9:00 on Thursday. I saw Gavin Dudeney with a spare seat beside him, sat down and said hello, and he remarked that the wireless was working quite well there. I pulled out my iPhone and sure enough it was. I tweeted to my network that this was a good sign. I might be able to present live at 11:00, as I had "mentioned" earlier on the Webheads list. After the plenary session, I went to the room where my own session would be and half listened to the presenter at 10:00 there while firing up my laptop and connecting flawlessly to the wireless. Elluminate came up perfectly. I uploaded my presentation to the whiteboard in Elluminate. Elluminate is available to Webheads thanks to a grant from Learning Times, whom I can never thank enough for this remarkable service, one of many pieces loosely joined in a network of globally connected educators. Speaking of networks, I then tweeted to my PLN that I was preparing to go live online, and I sent an email to the webheads list with the same information. When it was my turn to set up at the front of the room I had already been joined by one or two people in Elluminate. I was easily able to record my presentation, both voice and webcam. I turned the cam occasionally to give a sense of the surroundings, not just present a talking head. Cristina Costa joined in and although circumstances compelled me to present somewhat didactically, I managed to engage her for a moment in reminiscence of a chat we had had the summer before with Etienne Wenger, where she had remarked that she knew she was a member of a community of practice when her practice changed. The audience, sometimes sceptical at such events, warmed to the occasion and became noticably relaxed and engaged as we went along. Their satisfaction plus that of the online audience, plus getting everything to work and connect, all presented more than one ball to juggle. The last ball to pull out of the air is closing the Elluminate session, then retrieving the URL of the recording minutes later, then posting the URL onto various spaces including Twitter, the webheads list, and blogs. Later someone asked me to put it on Facebook, they could get it there. The Twitter posting makes a particularly good link for the slides and session recording. The point I'm making here is that this is the way conferences should be. We shouldn't all have to leave our networks at the door, or at home, or wherever the last hotspot was. Face-to-face conferences are augmented by connectivity and backchanneling among participants, as are our classrooms. This is another important point: how we connect at conferences is how we connect in real life. And that should carry over to how we connect with students and they with us and how we all connect with peers both face-to-face and online. Conferences are places we go to network and to learn. As I pointed out in my presentation, echoing Stephen Downes, teaching is modeling and demonstrating. This is what we should be doing at our conferences, modeling the tools we can use with each other and YES with students. None of this connectivity should be blocked or suppressed. The Washington Post article referenced earlier may indicate an attention deficite disorder inherent in multitasking but it also reveals a phase through which we all must pass. As a teenager I used to show off to peers by driving fast and irresponsibly, in an era where seatbelts were not the norm. Now in the UAE I see much evidence of this same lack of sophistication. But we all grow out of it. We educate one another how to maximize the potentials of the technologies we harness while avoiding the pitfalls that many of us toy with when the technlogy is new to us. In other words, if people are checking cell phone messages in class or meetings, diverting attention from the meeting itself, they are hopefully going through a temporary phase. In time it will become understood that there is a time and place for that. It used to be that in my classes students would sneak onto MSN messenger. Now they almost never do that. These days they might switch in and out of Facebook, but Facebook is less intrusive. Use of mobiles is more of a problem now, but in time we will have learned how to use them appropriately to effectively leverage our learning by widening our networks and accessing data needed for class or workplace intelligence. (Actually I found today two of my students on MSN, but it turned out they were in communication with each other, back-channeling in the classroom. I thought that this was an appropriate use of the tool). I remember one time Gavin mentioned in a recorded presentation his discomfort with people interacting with their media while he was presenting, but now I'm glad to see that he has his iPhone and laptop with him and happily uses them in enjoyment of always-on connectivity. The back channel at the conference was all aTwitter. At one point Gavin asked his Twitter network for advice on what to do evenings in Dubai, and I rose to the occasion with the definitive 140-character travel guide for Dubai: "@dudeneyge in Dubai, go to the creek, cross it in an abra, walk through the souks at either end of the abra ride, Deira & Bur Dubai, & dhows" <http://twitter.com/VanceS/status/10368130620>. I don't know if Gavin ever got the chance to actually follow my itinerary, but at least he and hundreds of my followers were 140 characters wiser for what Gavin was missing. That's how knowledge spreads throughout a network, and what we should see a lot more of at face-to-face conferences, wherever they are held, although where they are actually held is getting to be increasingly irrelevant in our increasingly networked world. PS: I just stumbled on Terry Freedman's compilation of resources at http://www.ictineducation.org/free-stuff/ and found there an article on "What I look for in a conference". On the wish list is "#7 I wanna be connected: The best conference will have wi-fi throughout the venue, including the hotel. There must also be a conference Twitter feed, and Flickr and Technorati tags." Indeed.